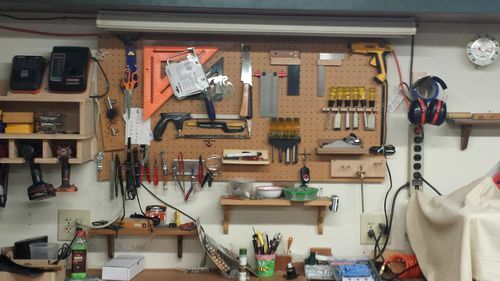 I am and have always been a fan of peg-board. It’s easy to hang and very versatile. 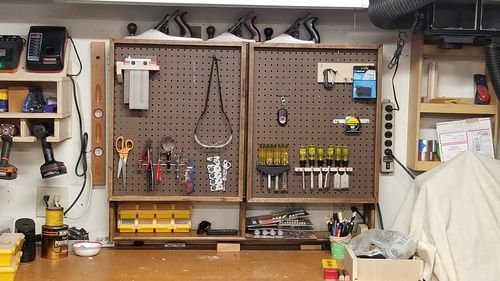 My shop is in the garage of my home and I share it with the washer & dryer, water heater and the wife’s car. Every inch is precious space to me. I have been watching Rag-n-Bone Brown on YouTube and I have been heavily influenced by his determination to use recycled wood whenever possible. We had an old entertainment center that we had purchased when we bought our house 25 years ago and it had been moved from room to room as it became less and less useful. I decided to take it apart an maybe use the plywood & Oak trim for a jig or for set up or whatever. 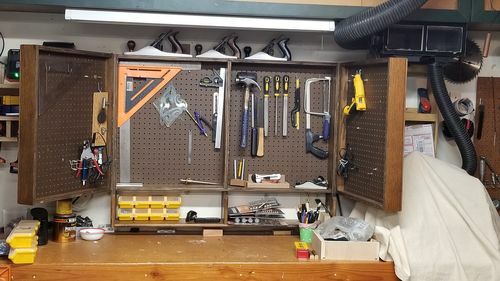 After seeing how many of you built these nice hanging tool cabinets I decide that I wanted one too so after looking at several I drew up a design that would work with the space I had. I was headed for Lowes to buy some plywood when it started raining. Ratts!......Now what am I gonna do? Old entertainment plywood to the rescue! Here is what I wound up with. 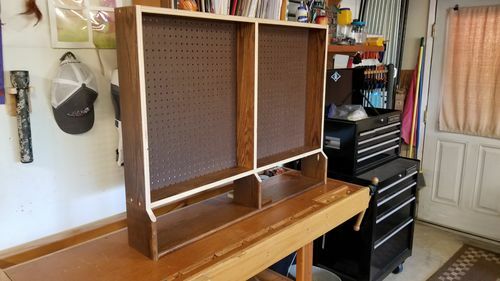 It’s not purdy…..It’s got holes in places that I don’t need them…...even a few surplus dado’s but it works great and the wood I used was given a second life. It’s approximately 50”x 33” and 8” deep and hangs from a french cleat. I have 3X the storage I had before in the same wall space. All I had to buy was the piano hinges. The rest of it is pure recycled material. I must admit, it was fun to build something without worrying about the quality of the build. Nice job. Great way to significantly increase your storage space and reuse materials that would have otherwise wound up in the trash. Nice project. Enjoy the organization.